Barlowe's Herbal Elixirs now offers a 10:1 Albizzia Julibrissin Flower Extract which is excellent for relieving anxiety and stress. Known in China as "He Huan Hua," it is the traditionally prescribed remedy for grief, worry and sadness. Many herbalists consider Albizzia Flower to have a more profound effect than St. John's Wort. Bottled in Glass! No Stearates! No Fillers! No Junk! 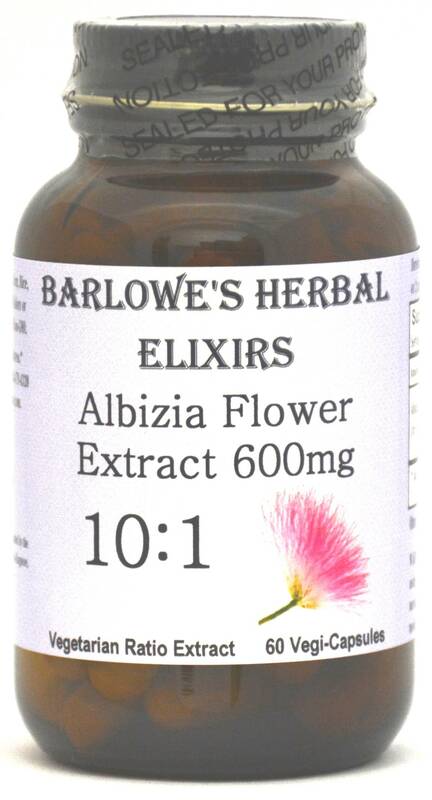 Barlowe's Herbal Elixirs now offers a 10:1 Albizzia Julibrissin Flower Extract which is excellent for relieving anxiety and stress. Known in China as "He Huan Hua," it is the traditionally prescribed remedy for grief, worry and sadness. Many herbalists consider Albizzia Flower to have a more profound effect than St. John's Wort. 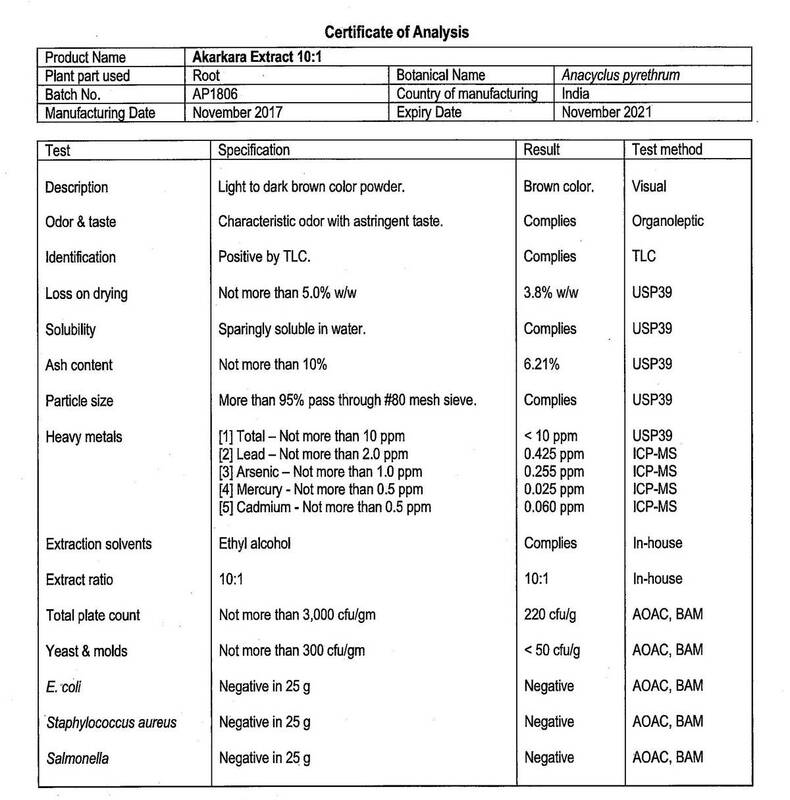 The Albizzia Certificate of Analysis (COA) for this particular batch is shown above. Bottled in Glass! No Stearates! No Fillers! No Junk! Albizzia Julibrissin (or Mimosa Tree) is oftentimes called the "Happiness Herb" by the Chinese. Its use was first documented in the Shen Nong Ben Cao (Divine Husbandman's Classic of the Materia Medica) during the 2nd century for its mood supportive and calming properties, as well as for its tonic properties. Chinese herbalists traditionally recommend its use for anyone who is suffering from grief as a result of a severe loss. An extract of Albizzia Flowers is said to "lighten" the spirit. The flowers have also been used for the treatment of insomnia, amnesia and sore throat in Asian traditional medicine, as well as for melancholy and anxiety. Many herbalists consider Albizzia Flower to have a much more profound effect than St. John's Wort (Hypericum Perforatum). With hundreds of years of traditional use, Albizzia has proven to be a useful anti-anxiety herb with no known side effects. It is the ultimate calming herbal extract. 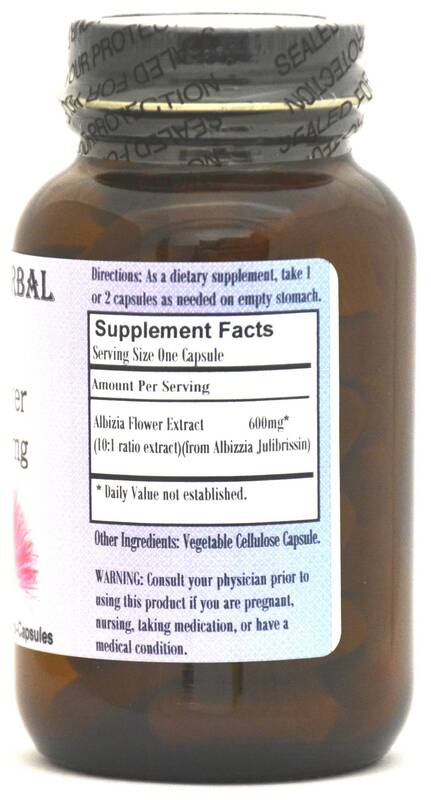 Caution: Barlowe's 10:1 Albizzia Julibrissin Extract is generally safe, but it is potent and should be utilized with care. This product is for dietary use. If unexpected side-effects occur, discontinue use immediately! The above statements have not been evaluated by the Food and Drug Administration (FDA). This product is not intended to diagnose, treat, cure, or prevent any disease. Directions For Use: Take one or two capsules as needed on empty stomach. Results and usage amounts may vary based on body type and weight.